Hook sizes: H (5.0 mm), G (4.0 mm) for final sc rnd. Gauge is relative for this project, the most important gauge for this pattern is determining your own head size before beginning as this will be the gauge as to how wide the crown circle for YOUR hat needs to be. Not hook size, not yarn size, not the number of Rnds shown in the pattern, but your own head size. Hat Sizing Tip: Measure around head just above eyebrows (keeping tape level) and divide that measurement by 3.1416. The result is the width your crown circle needs to be before continuing to Rnd 9. Example, head measures 22” around; 22 ÷ 3.1416 = 7.0028; Crown circle needs to be 7”. Rnd 6: Ch 2, dc in each of first 3 dc, *work 2 dc in next dc, dc in each of next 4 dc, rep from * around, work 1 dc in last dc, sl st in 2nd ch to close ring. (60 dc) (If you stop crown here, Hat Body directions can be found at the end). Rnds 9 – 12: Ch 2, dc in each dc around, sl to into 2nd ch to join. Rnd 15: Ch 1, skip 1 dc, *work 5 dc in next dc, skip 2 dc, sc in next dc, rep from * around, ending with 5 dc, sl st in beginning ch to join. Rnd 16: Ch 2 (counts as dc), work 2 dc in sl st, *sc in 3rd dc of shell, work 6 dc in sc, rep from * around, ending with sc in 3rd dc of last shell, work 3 dc in sl st to complete beginning shell, sl st in 2nd ch to join. Rnd 17: Ch 1, *work 7 dc in next sc, sc in 3rd dc of next shell, rep from * around, ignoring last sc, sl st in beg ch to join. Rnd 18: Ch 2 (counts as dc), work 3 dc in sl st, *sc in 4th dc of shell, work 7 dc in sc, rep from * around, ending with sc in 4th dc of last shell, work 3 dc in sl st to complete beginning shell, sl st in 2nd ch to join. Rnd 19: Ch 1, *work 7 dc in next sc, sc in 4th dc of next shell, rep from * around, ending with 7 dc, sl st in beg ch to join. Rnd 22: Ch 2 (counts as dc), work 3 dc in sl st, *sc in 3rd dc of shell, work 8 dc in sc, rep from * around, ending with sc in 3rd dc of last shell, work 3 dc in sl st to complete beginning shell, sl st in 2nd ch to join. Rnd 23: With G hook, *Sc in each dc, sl st into sc, repeat from * around, sl st to end off. Rnd 7-10: Ch 2, dc in each dc around, sl st st into 2nd ch to join. Continue pattern at Shelled Brim. 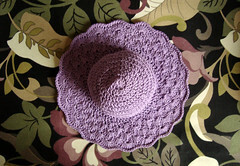 This pattern is similar to my Shell Brimmed Cloche but flares away from the head a bit more. 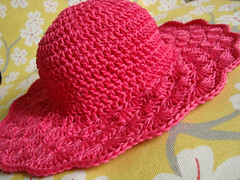 This hat was inspired by Melissa Rotert’s, Gulf Shores. © All rights reserved. This pattern is available to you for personal use free of charge. Do not post this pattern on any other site without written permission from me, please link back here. Please report any problems. Thank you for this pattern. 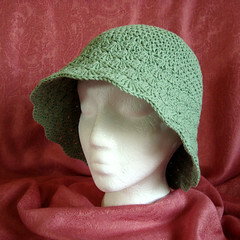 I really need a summer hat to shade my eyes and this looks like it will do the trick. I am off to find my calculator now! Ta for sharing. I would also like to know how to stiffen it. I like the brim that stands out, not flops down. Thank you. I love you explaining the measurements for the crown of the hat! Hats are pretty much what I do now & I've never heard/seen anyone explain it that way. Thank you!! Thanks for sharing--I was looking for something different! You might try starching it. If you use cotton starching would work well and should have enough give to still wear the crown comfortably. you could also try working some light gauge wire into the brim to stiffen it. Can the patteren for 6-12 month olds be adjusted for an adult? The cloche is ok but I'm really interested in the more "flared" pattern for older childred and adults I see them as beautiful Easter hats that beg to be embellished!! I don't understand when/if you would use Rnd 6/Rnd 7 Crown Hat Body adjusments? anna, yes you would just move on to the hat body. You have to determine the width needed for your hat crown to decide whether or not you can stop at Rnd 6 or if you need to do Rnd. 7, they are used to adjust hat size. I'm having trouble with row 14. If i work as written, i end up with 91 sts and 4 sts left unworked whereas the pattern says i should have 105 sts. What am i doing wrong? I just finished my hat. I used the Sinfonia & made an adult size hat. It's very floppy, but I love the color & texture. When you say "light worsted weight yarn", do you mean something like Caron Simply Soft that works up slightly smaller? Or do you mean like a "2" or "3" in relation to weight? thanks! 1.I am now using the unaltered pattern and I have reached row 14, but am finding that the counts and instructions are askew. Rnd 13 adds up to 88 if I do 8 dc in the first set to allow for the ch 2, but I cannot reconcile row 14. 2. Other patterns I have read and videos I have watched advise making the circumference of the hat slightly smaller than the circumference of the head so that when it is worn the slight stretch in the yarn makes for a good firm fit. Row 13 increased the hat circumference from just under 20" to over 22" and I was wondering if this is to allow for non-stretch in the shell brim? Please let me know when you can and thanks again for sharing. tracy, please either register so I can get an e-mail address to respond or contact me on Ravelry. Your photo/project/pattern has been featured on my website. Please visit to review the post. copyright, please let me know ASAP so I can remove it immediately. The hat is beautiful! Do you have a tutorial where you do it step by step? I am not really good reading directions, but I could follow instructions. Thank you.